Combine the soy sauce, brown sugar, hoisin sauce, ginger, garlic, lime juice and sesame oil in a small saucepan; bring to a boil. Once the sauce comes to a boil, lower the heat to medium and simmer for 10 minutes or until sauce has started to thicken. Remove and discard pieces of ginger and set the sauce aside. Preheat broiler. Line a sheet pan with foil, coat with cooking spray. 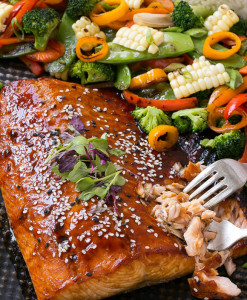 Place the salmon fillet on one side of the pan; season the salmon with salt and pepper and lightly brush with the hoisin glaze. On the other side of the pan, place the mixed vegetables. Spread the vegetables out into one even layer. Season the vegetables with salt and pepper and spray them with cooking spray. Place the pan under the broiler - broil for 10-15 minutes or until salmon and vegetables are cooked (mine took 12 minutes). Remove the pan from the oven and brush more glaze over the salmon. Drizzle glaze over the vegetables to taste and then toss to coat. Garnish with sesame seeds, lime wedges and green onions. Serve the salmon and vegetables with steamed rice, with any extra glaze on the side for dipping or drizzling. Make Ahead: You can prep all the vegetables and make the rice up to one day in advance. Freeze It: If you have extra salmon glaze you can freeze it in a resealable bag and use it for another night. Sauce will keep in the freezer for one month. You can easily divide this recipe in ½ to serve 2 people easily.